Miami – Dade Contractors In Miami, Dade County, Miami Beach, Hialeah, Miami Gardens, Kendall, Homestead, Florida Keys. Preparation is the key to any successful installation. Over 80% of coating failures can be attributed to improper or insufficient prep. It is important to provide a clean surface free of contaminants and defects with a profile or texture. Resinous and even inorganic floor toppings or overlays on concrete rely on mechanical bonding for long-term, quality adhesion. At Concrete Floor Prep, Our areas of expertise include hotels, art studios, retail stores, shopping malls, water treatment facilities, medical storage facilities, warehouses and other companies requiring specialized coatings. Our flooring solutions will provide your facility with a clean dust free environment that untreated concrete floors cannot achieve. 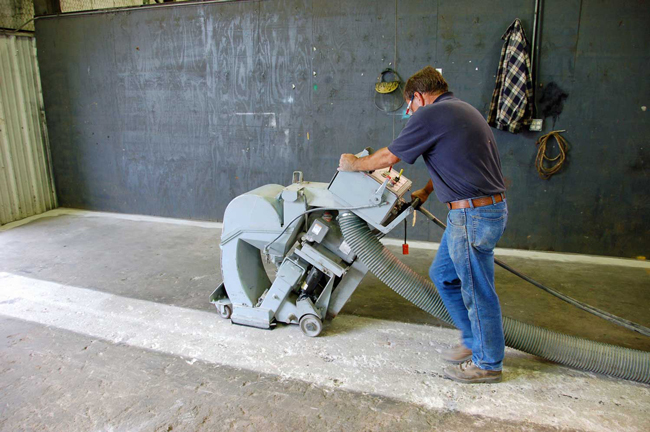 Come to us for quality services in concrete grinding, restoration, cleaning, and profiling. We do shot blasting and diamond grinding on any kind of concrete surface, such as industrial plants, warehouse floors, parking garages, bridges, and runways. Many of our customers are coating contractors, painting contractors, general contractors, and engineering firms. No job is too small or too large! We’ve got the capability to do approximately 100,000 square feet in one day, depending on the condition and layout of the floor. Concrete Floor Prep Shotblasting is not only a professional contractor, we are specialists with a strong reputation for providing quality work and personal service. Diamond Grinding is a new addition to floor preparation. Just as shot blasting, this new technique is also dustless. As in the above photo, diamond grinding can grind over existing coatings for a recoat or the diamond heads may be changed to remove thick mill coatings. Glue or thin set is not a problem either! After carpet or tile has been removed, the Diamond Grinder will do the job! For additional information, give us a call to discuss your individual needs.